Lighting an aquarium would be a simple affair if only aesthetic considerations mattered, however advanced aquarists’ goals often include husbandry of plants, algae, corals and other photosynthetic organisms. To that end, it was originally suggested that only ‘intense’ lighting was required, and spectral characteristics were of a secondary concern. Our understanding of the needs of reef organisms has advanced over the years. These two categories can not be mutually exclusive. A lighting source of high intensity (PPFD) and low useful output (PUR) has few practical applications, while the opposite is also true – low PAR output with high PUR is of limited usefulness. This time, we’ll look at PPFD and PUR generated by ultraviolet, violet, and blue LEDs in an Orphek Atlantik V4 LED luminaire. The procedure used was as follows. A Li-Cor LI-1200 quantum meter’s sensor (calibrated for ‘air’ measurements) was placed directly over the LED and the result (as µmol·m²·second) was recorded. PUR was estimated through use of a Seneye Reef device that reports the result as a per centage. The Seneye estimates PUR by comparing red, green, and blue outputs. 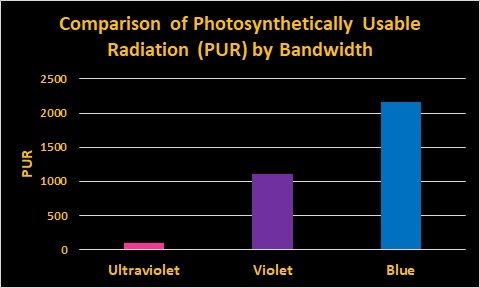 Photosynthetic efficacy was estimated by multiplying PPFD by per cent PUR. While the procedure is not perfect (particularly with LEDs producing radiation outside of the PAR sensors window of 400-700nm) it does allow a rough estimate of performance. This luminaire contains 4 LEDs producing UV radiation with peaks at 382, 383, and two at 384 nm. These wavelengths are useful in photosynthesis – they can be absorbed by chlorophylls a and c2. Ten violet LEDs are found in this luminaire, with peak outputs at 410 to 428nm. 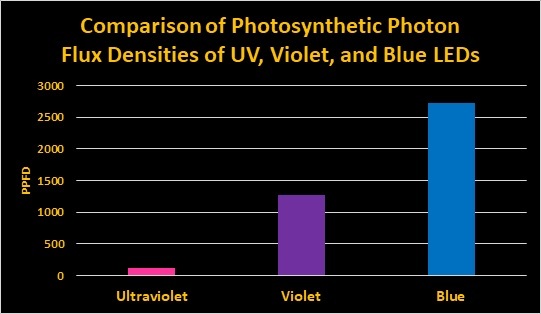 Some of the comments made about UV radiation are applicable to violet wavelengths as well. Water appearing blue to our eye is the hallmark of clear oceanic waters, hence blue light makes a reef aquarium appear natural but more importantly, chlorophylls absorb this light and use it in photosynthesis. 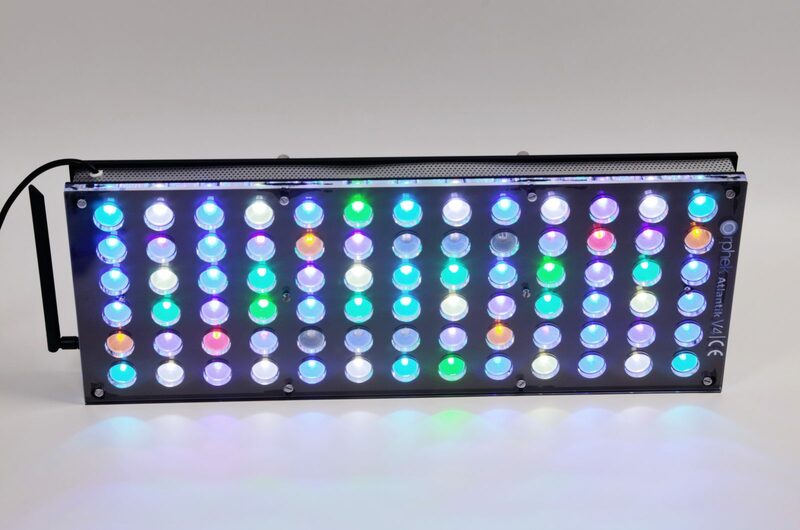 This luminaire contains 32 LEDs producing blue light, ranging in peak outputs from 431 to 473nm. Using the techniques previously described, these are the average PPFDs of these LEDs. As mentioned, PPFD is only part of the story. We’ll now multiply the PPFD values by PUR factors obtained through use of the Seneye device. These are the results. Next time, we’ll look at other bandwidths and discuss their importance. Subscribe now for more news ! fill this quick form (all fields required).